There is a part of ourselves we cannot see and therefore often overlook. It is called energy. Chinese medicine recognises the flow of energy in our bodies as being vital to balance and health. Reiki is an alternative therapy, a means of unblocking and rebalancing that energy flow. And Reiki can be beneficial if you have IBS. During my experience with IBS there were times I felt like I had hit a wall. I was mentally and physically exhausted from flare-ups and the viscous circle of IBS These were times when my health took a turn for the worst, and it felt like my energy and my morale just fell through the floor. One day I felt so desperate I decided to contact a Reiki practitioner I had been recommended. I remembered that a relative had found this really helped them with a medical problem. So I went along, not really knowing what to expect. I made the mistake of just going once and thinking it would work like some magic wand. Although I went just once, I came out feeling more grounded and appeased, emptied of superfluous thoughts and emotions. After a few days, I found I had more energy and my digestion had improved somewhat. Inevitably those symptoms came back over time as the causes had not been resolved. But it was great to find something I could fall back on when I really needed it. Reiki may look very strange and mystical, but it really isn’t. It has its roots in quantum physics and has been used for centuries as an ancient healing technique. Everyone has access to this energy. Some people have a particular sensitivity to the energy in and around us and cultivate this, while others don’t. Depending on the practitioner you may be asked to stand and hold onto a chair while the person makes moves with his hands behind your back. This can feel and seem strange, but it is just part of a rebalancing process or a way of charging you with energy. Generally you are asked to lie down fully clothed, as you would if you were having a beauty treatment. The Reiki practitioner will usually start by placing his hands over your eyes or above the crown of your head for a few minutes. 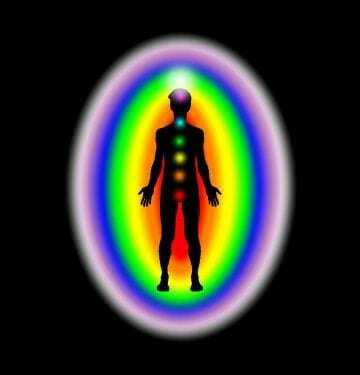 They will then proceed to check each energy center (chakra) in the body. Many Reiki practitioners will not need to touch you, but just place their hands a few centimetres above your body. Others prefer to use a hands-on approach. A session will often last from 45-60 minutes, the time for energy to be applied to all the chakras going from the head down to the feet. At the end, the practitioner will use both hands to “wipe” any remaining energy around your body down to your feet. Since recovering from IBS, I have discovered the sensation of energy, and have become a Reiki Master. So I can tell you what I feel. When energy is required in a person’s body it creates a sensation in my hands. This can be tingling, or a rush of energy through the palms of my hands. The rush is created when the energy in part of their body is imbalanced and needs or “calls” energy to help rebalance it. When the energy becomes balanced again, I lose the sensation in my hands and move to the next chakra. If there is a physical wound or inflammation, the energy helps to relieve it by supporting the body’s own healing mechanisms..
You may have some sensations that start up – or nothing at all. You may find you stomach starts gurgling, or you may have a tingling sensation in a totally different part of the body. Whether you have sensations or not, the energy is doing the necessary work of rebalancing. Reiki energy can support you and appease mental and physical tension to a certain degree. When I went I felt very tired for the next following days. This may not be the case with you, but bear this eventuality in mind and plan the session at the end of your working week when you can find time to rest if needed. My clients often report feeling very tired the first time, but not so much (or not at all) in the following sessions. The following sessions allow a deeper rebalancing, so it is really worth having at least 4 to sessions get the full benefit. It can help reduce inflammation in any part of the body (including intestines and any part of the digestive tract) and supports the body’s own healing mechanisms. Reiki is not a magic wand but can bring you a certain degree of welcome relief.